All Exit by Jennifer and Kevin McCoy traces American ideology of manifest destiny and the new/old frontier. In the piece "Aerie," a corporate tower with the Twitter logo sits atop a steep cliff. 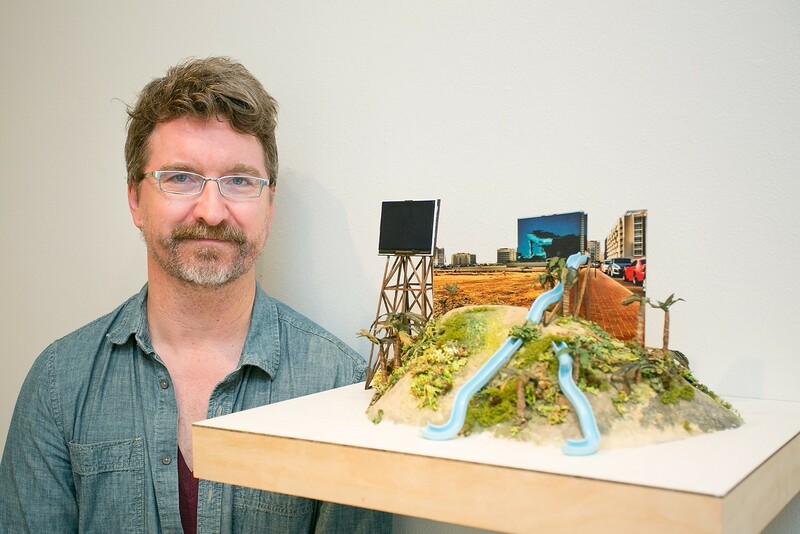 The cliff is a 2D cardboard cutout jutting out of a 3D sculpture of a mountain in front of an oil-painted landscape with a small screen showing footage of a corporate building floating in the sky above. The entire scene is encapsulated into a diorama housed in a small black box. "Aerie" is the first piece you see when you enter All Exit, a show by Brooklyn-based artistic duo Jennifer and Kevin McCoy currently on view at Johansson Projects (2300 Telegraph Ave., Oakland). It physicalizes the various levels of abstraction involved in the representation of online corporate entities such as Twitter, by bringing together media that range from the realistic to the romanticized. In part, the show is interested in articulating the role of these Silicon Valley icons in contemporary cultural mythology, making them tangible in order to point out the way they are fictionalized. Most of the artwork that aims to expose the shadowy underbelly of Silicon Valley comes from the Bay Area and points to specific instances of displacement or discrimination. But the McCoys are interested in the way that Silicon Valley as an icon fits into the broader cultural narrative, tracing the historical trajectory of the chase for free enterprise and the ways that it consistently overlaps with dreams of a utopian, tech-filled future. Part of that is identifying how the lawless appeal of the frontier still exists today, costumed in conservative political outfits. "This sort of blending of political and philosophical thought meshed into business practice is such a uniquely American trope, and it's sort of part of the American psyche," said Kevin McCoy in an interview. In "Priest of the Temple," a cutout of tech titan Gordon Moore's head juts out of a clay ruin of a corporate headquarters atop a mountain of rubble. A tiny screen showing a marketing video for a massage at a luxurious Silicon Valley spa is posted out front. Two cameras capture the diorama live, and run it to a mounted computer, where software that Kevin coded collages the footage in real time before another projector shines the kaleidoscope of imagery onto the facing wall. Meanwhile, eerie music sets an ominous tone. The piece presents a metaphorical model of the system that feeds us mediated and mythicized culture, implying that the reality we are confronted with only comes to us through a series of filters. At the same time, it alludes to an apocalyptic future at the far end of the lineage it traces. Gordon Moore is both the cofounder of Intel and the father of Moore's Law, the 1965 prediction that every two years, computing capacity would double — which has proved accurate to this day. It's a progress narrative that exemplifies the broader push toward technological innovation and the dream world that comes with it. "That idea has had such vast cultural impact, but it also is by definition a kind of exponential," Kevin said. "And exponentials eventually blow up."